Join us for the show that The Washington Post says "... should be part of every family's holiday festivities. ... one of those rare events that delight people of all ages!" Piffaro, the nation’s finest Renaissance wind band, enjoys a dynamic full year season performing both in the US and globally in a variety of public and private venues. 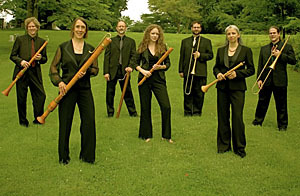 World-renowned for its highly polished performances as the pied-pipers of Early Music, Piffaro is also active in education and workshops, as collaborators in the research and making of historically based instruments and programs, and as experts in reed-making and Renaissance performance practice. Piffaro’s ever-expanding instrumentarium includes shawms, sackbuts, dulcians, recorders, krumhorns, bagpipes, lutes, guitars, harps, and a variety of percussion — all careful reconstructions of instruments from the period. Piffaro’s Directors are very involved in researching model historic instruments and working with the finest instrument makers to realize beautiful and accurate reproductions that give way to authentic Renaissance sounds. Indeed, Piffaro is known by players and listeners in the USA and across the globe for its role in redefining the Renaissance shawm sound. Founded in 1980, Piffaro recreates the rustic music of the peasantry, as well as the elegant sounds of the official, professional wind bands of the late Medieval and Renaissance periods. The group is modeled after the official civic, chapel and court bands that were the premier professional ensembles from the 14th into the early 17th centuries.